Goals scored or created with the aid of a hand or arm, even if accidental, will be disallowed next season after football's lawmakers approved several changes to the rules. 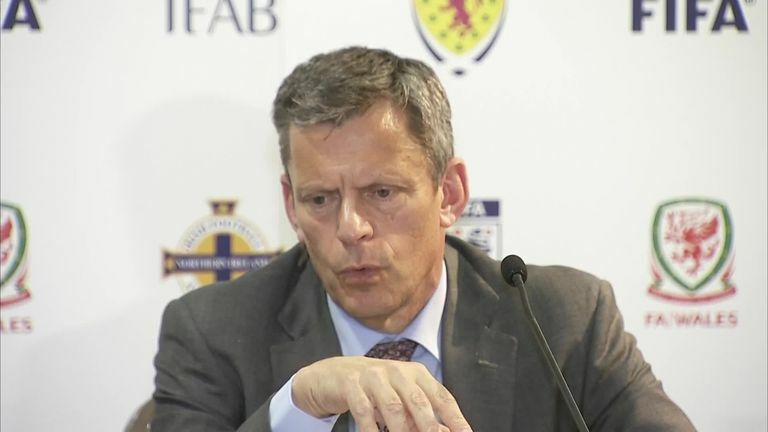 The International FA Board (IFAB) voted to "fine-tune" some laws at their annual general meeting in Aberdeen on Saturday and among the changes was an attempt to end confusion over "deliberate" contact with the ball. "On the topic of defining handball, a decision was taken by the IFAB to provide a more precise and detailed definition for what constitutes handball, in particular with regard to the occasions when a non-deliberate/accidental handball will be penalised," read an IFAB statement. "For example, a goal scored directly from the hand/arm (even if accidental) and a player scoring or creating a goal-scoring opportunity after having gained possession/control of the ball from their hand/arm (even if accidental) will no longer be allowed." In other changes approved by IFAB, substitutes will have to leave the pitch at the nearest goal line or touchline instead of walking to their technical area in a bid to stop time-wasting. "Additional approved law changes included: measures to deal with attacking players causing problems in the defensive 'wall'; changing the dropped ball procedure; giving a dropped ball in certain situations when the ball hits the referee; and the goalkeeper only being required to have one foot on the line at a penalty kick." IFAB is comprised of the four home nations, who each have one vote, and the world's governing body FIFA, which has four votes, while rule changes need at least six votes to be approved. The law-making body also acknowledged that the introduction of video assistant referees had been a big success. "Following the historic decision taken a year ago at the 132nd IFAB annual general meeting to approve the use of VARs, the FIFA president Gianni Infantino, in unity with fellow members of the IFAB, expressed their satisfaction with the significant impact and success VAR has had," IFAB added. "Partly as a result of its success in the 2018 FIFA World Cup in Russia, VAR is now an accepted part of football and has brought greater fairness to the game without any significant interruption with reviews on average taking just over a minute once every three games."